Are we not monster kids? Michael Legge (aka Dr. Dreck) joins Derek this week to talk about one of the good doctor's favorite horror films. Are we not monster kids? The two of them tackle 1932's Island of Lost Souls (dir. Erle C. Kenton). Are we not monster kids? Along the way, Michael and Derek touch on other cinematic versions of the H. G. Wells' novel The Island of Doctor Moreau, but their focus remains on the first (and best) adaptation of this science fiction classic. (Can you guess who hasn't read the original novel?) Plus, FEEDBACK. Are we not monster kids? Ygor - Son of Frankenstein/Ghost of Frankenstein. 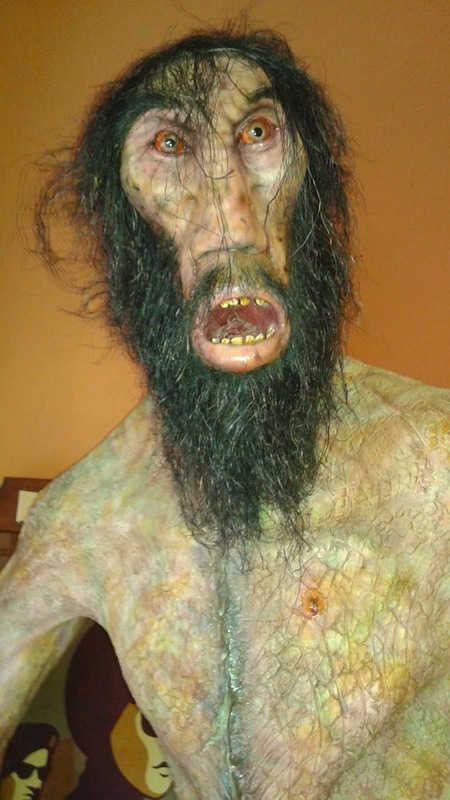 Derek recently revealed that Ygor is one of his favorite Jack Pierce make-up designs, and while Pierce's work is without equal, Lugosi's performance is certainly as responsible for the success of that character. That Ygor was originally written as a much smaller part in Son of Frankenstein is unfathomable at this point. Lugosi steals the show. His Ygor in Ghost of Frankenstein is still enjoyable, even if he is a little cleaned up a little bit. Dr. Paul Carruthers - The Devil Bat. As much as he's associated with playing vampires (and a very specific vampire at that), Lugosi also shines in the role of the mad scientist. The Devil Bat is one of the best of the poverty row films, and that's almost solely because of Lugosi's varied performance as the scientist driven to guilty revenge. Von Housen - Vampire Over London (My Son, The Vampire). Is this high art? No. Does Lugosi have an opportunity to disspell the myth that he couldn't handle comedy? Definitely. Additionally, there are shades of mad scientist here as well which always makes Bela watchable. Clearly there are more films in Lugosi's filmography worthy of extra attention and/or praise. What are some of your favorites? The work of Jack Pierce is undeniably one of the cornerstones of what we as monster kids LOVE, and while we here at Monster Kid Radio Headquarters might know a few things about the man, we could certainly stand to learn more. 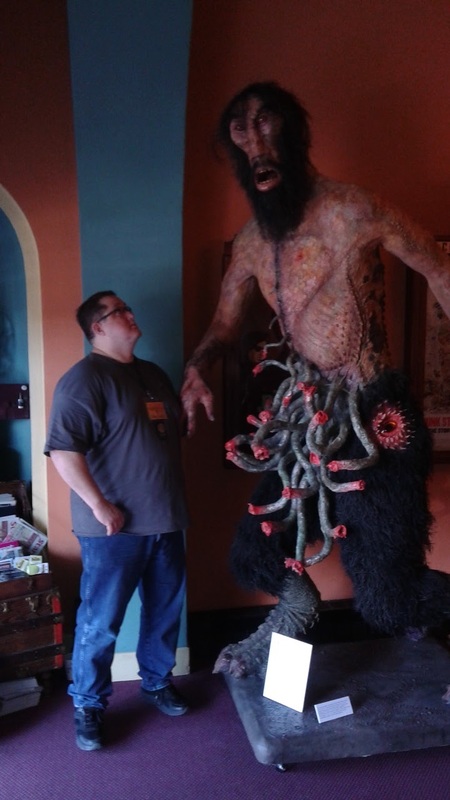 Fortunately filmmaker Strephon Taylor is here to help us with his new documentary Jack Pierce, The Maker of Monsters. This new release from November Fire relates Pierce's early life, his incredible career, and even some of his activities away from the make-up chair. After learning a bit about Stephon's background as a monster kid, and a lot more about Jack Pierce, Derek and Strephon go over their top three favorite Jack Pierce make-up designs. 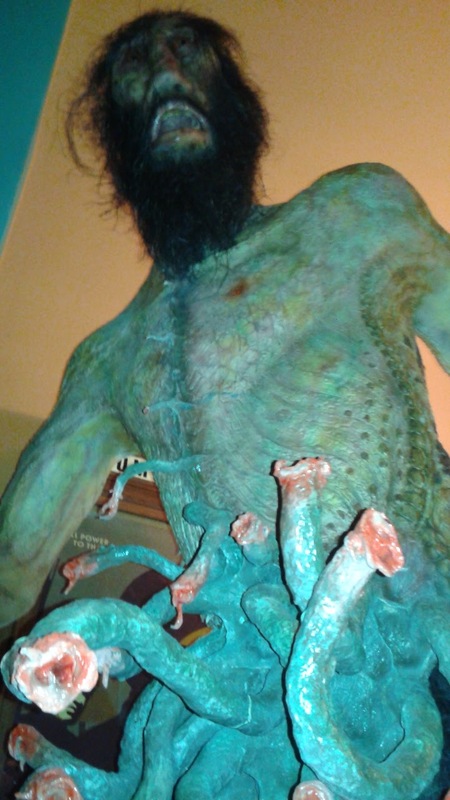 Also, Derek mentions two upcoming Monster Kid Radio Crashes happening in the Portland area! Shackle Island Studios and Red Headed Revolution Pictures have unveiled their newest Public Safety Film, Happy Halloween With Dr. Gangrene. The new short film features Larry Underwood as Dr. Gangrene listing a number of safety tips to pint sized trick-or-treaters. The safety film was written by Larry Underwood and directed by Cameron McCasland. It was filmed in Middle Tennessee and features McCasland's young children Roxie & Marie McCasland as well as Jessica and Joseph Auguon Drake Jr. whom McCasland had previously worked with on other projects. The poster for the short was designed by J. Kyle Kelly at Villain Place in Nashville, TN. Kelly also shared shooting duties and editing on the project. The cartoon image of Dr. Gangrene is courtesy of artist Jeff Carlson. This new public safety film follows in a long line of shorts from collaborators McCasland & Underwood. Their "Go Green With Dr. Gangrene" series ran for several years and received praise from the governor of Tennessee and the Nashville City Council. It also garnered national attention, picking up awards from the AEGIS awards, Ava Awards, MarCom Awards, Blingy Awards, The Accolade Competition, The DV Awards, a Public Service award from the Rondo Hatton Classic Horror Awards, and four Emmy nominations from the Midsouth Chapter of the National Television Academy of Arts & Sciences. 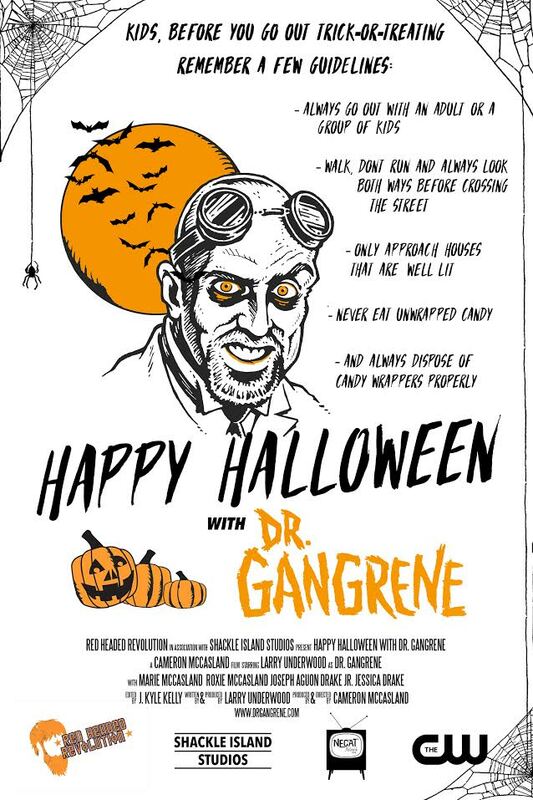 Happy Halloween With Dr. Gangrene will air on The CW network as well as the NECAT network locally in Nashville, which currently airs re-reruns of the television program "Dr. Gangrene Presents." 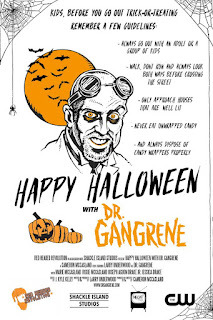 It will also be screening at a number of Halloween-themed events in October hosted by Dr. Gangrene, including the rock n' roll extravaganza Dr. Gangrene's Horror Hootenanny. In addition to this new short film, Underwood & McCasland are helping fans celebrate Halloween by making their 2010 Emmy nominated made for television movie The Dreadful Hallowgreen Special available to stream for free during the month of October on the Dr. Gangrene YouTube channel. The half-hour comedy also features New England's Penny Dreadful and the legendary Count Gore DeVol. After a bit of BREAKING NEWS from Stephen D. Sullivan, Derek takes Monster Kid Radio back to last weekend for the 20th Annual HP Lovecraft Film Festival. While there, he introduced a film, participated in a panel, gave a presentation, and interviewed a few fellow guests like Chris McMillan, Reber Clark, and Sean Hoade. Near the end of the fest, Derek sat down outside the Hollywood Theatre with one and only Brian Callahan to talk about the entire weekend (and, of course, start teasing about what we might all see next year!). Featuring the return of The Classic Five! Last week, I stated that Episode 238 would be all about the Inner Sanctum Mysteries, and would feature returning guest Paul McComas. 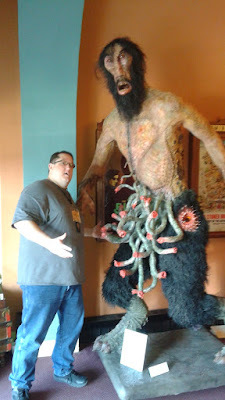 With the HP Lovecraft Film Festival this past weekend, I find myself needing to change things up and running the Inner Sanctum Mysteries show w/ Paul for Episode 239, leaving 238 for the HPL Film Fest. 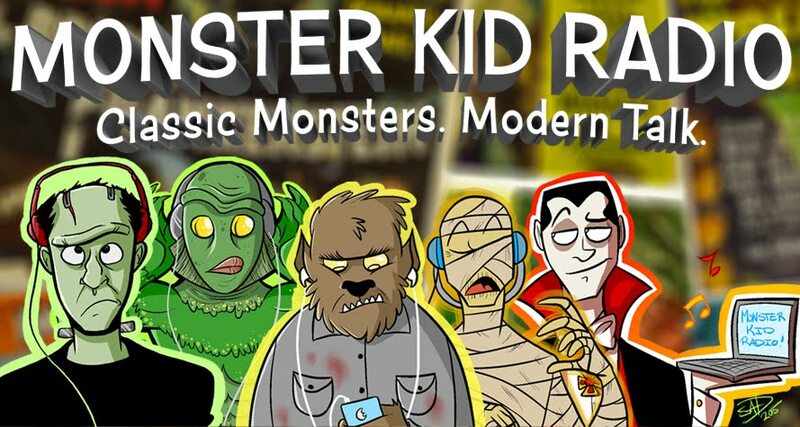 What will you get on the Monster Kid Radio feed this Tuesday? 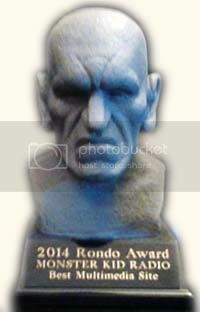 It may be Paul and the Inner Sanctum, it may be coverage from the HPL Film Fest . . . STAY TUNED!